Volume profile measures the confidence of the traders in the market. From short term trading perspective monitoring the developing volume profile in realtime make more sense to track current market participation behavior to take better trading decisions. 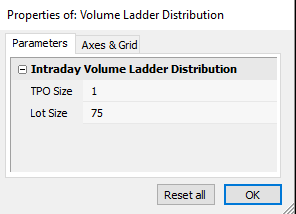 Here is the simple AFL Code we developed to understand the Intraday Volume Profile Distribution using Amibroker PriceVolDistribution and low-level graphics functions. Volume Point of Control is highlighted with red color block as it is the place where market finds its equilibrium and where most of the traders agree to trade at the fair value for the day. External Chart Control is added to vary the TPO Size and Lot Size for each and every individual scripts. After applying the indicators one can control the values by right clicking over the charts and select parameters. 1)Code is compatible with Amibroker 6.0 and above and will not work in lower versions as lower Amibroker versions doesn’t support matrix operations. 2)If you are applying the indicator to cash markets then set the Lot Size as 1. In case of future scrips relevant lot size. Final output of the volume profile on the left side is shown in term of no of contracts traded at each and every price level for that given day. One Timeframing and Amibroker Exploration Code One Timeframing is a simple, powerful and popular concept when comes to a market profile trader. One Timeframing generally refers to a market that is trending in one direction. It means your amibroker version doesnt supports matrix functions. Thanks it worked perfectly. Iam searching for this indicator in Amibroker atlast found it at marketcalls itself. Thanks for your selfless efforts. I m using Ami V 6.00.2.. But Getting error “syntex error,identifier ‘pricevoldistibution’ is undifined. Any other solution for this ?? Nope code is built to work on lower timeframes. Hi Rajandran, i have Amibroker 6.40 version, when i copied it as afl and ran it in AFL formula editor, it shows error when it reads “mx = PriceVolDistribution( H, L, V, tbin, true, sdvb, lvb );” and all such mx. Can you let me know how to rectify this. If Iam not wrong amibroker recent version is 6.2. Double check your version. I am a new trader what charges amibroker software?